SHAWN PORTER EXPLAINS HIS STYLE OF FIGHTING: "I ALWAYS TRY TO MAKE A GUY FIGHT ME THE WAY I WANT HIM TO FIGHT"
"Showtime" Shawn Porter (26-2, 16 KOs) is a monster in the ring of the old school, infighting variety. Porter is in the middle of training camp in Las Vegas, preparing for his April 22 bout against Andre Berto (31-4, 24 KOs). The fighter known as "Showtime" graciously stepped away from training for a few minutes and granted this exclusive interview. Besides being an offensive juggernaut who forces confrontation, Porter has underrated defense and boxing ability. When asked about these skills, he said, "I appreciate you for it-for recognizing that. I think that's something that's going to play out in this fight, as well, the boxing ability that I have. I thought we boxed very well against Keith Thurman, but we were also in line to be hit a little more than we wanted to. So I think moving forward, this fight, that's something we really focused on, being what we call responsible in defense, and being able to hit him and not get hit." Fighting effectively on the inside is a key component of Shawn's arsenal. I asked what it takes to be good on the inside, and how much confidence and experience play into it. "Yeah, you know, I think those are probably the key elements right there," Porter responded. "The confidence and the experience. You have to be confident that you're just as aware of your defensive movement as you are the offensive movement, because that's what it takes to fight on the inside, both offense-to bang the guy, to hurt the guy-but also the defense, once you hit that guy, to make him miss and come right back. So those two play hand in hand, and I think the experience of learning how to do that along with the confidence in doing that. "You know, I don't know very many guys out there even now, after watching me fight Keith Thurman, are confident that they could push the tempo with Keith, and go at Keith without getting hit. They don't have the confidence. I think it's just something that is inside of me. I was confident that going after Keith would get the job done, that was the best way we could beat him, and I was confident that I was gonna be able to hit him and not get hit. Even if I did get hit, I wouldn't be hurt to the point where I couldn't keep going. So I think you hit the nail on the head with that one; I think confidence really plays a major role in [infighting]." Building off of that, Porter discussed the mental aspect of his buzzsaw style. "You know when people talk about boxing being a hard sport, and you don't play boxing, you fight? That's something I 'play' with. The fact that, at an early age, being able to get a guy out of his game plan, or force him to fight my fight-that became the fun part to me. That was the challenging part to me, and that was the part that made sense. So that's something that, again, even at an early age, I recognized-if I could make a guy do what I wanted him to do, I have control of him. And for some reason, that's what makes me move, that's what makes me tick the most. Even now, that's always my mindset going into the ring, is I have my game plan, what I want to execute, what I want to do. But the other part of my game plan is not allowing the guy to get comfortable. And the number one thing with not allowing a guy to be comfortable is taking them out of their game plan and not allowing them to do what they want to do." When asked if it was exhilarating, as he developed this ability to control his opponent, to see it actually happen in the ring, Shawn said, "It was. I think it was kinda like the cartoon where the light bulb comes on over the character's head. I got the idea. I think once I realized what I was actually doing to people, which is a sense of manipulation-you know, manipulating a guy to turn the way you wanted him to turn, or making him miss and making him frustrated-all of those things are things that make me feel good when I have control of a guy. So that's always something I look to do when I get in the ring, is make a guy feel uncomfortable or not allow him to get into his own comfort zone, and fight me the way he wants to fight me. I always try to make a guy fight me the way I want him to fight." Aside from boxing, Porter regularly posts about music on his social media accounts. He disclosed who some of his favorite artists are, in and out of the gym. "Lupe Fiasco is probably my favorite rap artist. I think he really shows his intelligence through his music, and that's what I really like about him. But in camp, especially right now, it's definitely more gospel and more positive music. Kirk Franklin, Fred Hammond-they all have good up-tempo gospel music, but it's also very positive. I do still listen to rap from time to time, but if I do, it may even be some old school like LL Cool J, and Boogie Down Productions, BDP-also good music, good up-tempo music with good lyrics, you know?" 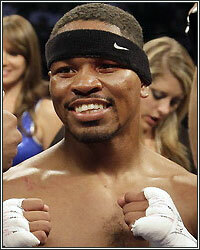 Shawn Porter faces Andre Berto on Saturday, April 22 at Barclays Center in Brooklyn, New York. Televised coverage via Showtime begins at 9pm ET/6pm PT.